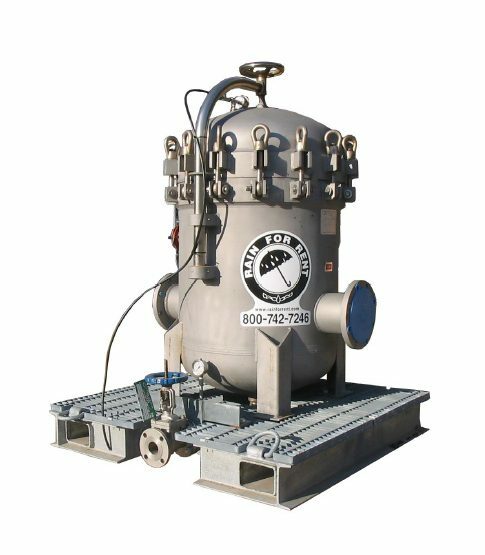 The BF1000 ASME bag filter unit features one bag filter tank and utilizes eight 7″ x 30″ bag filters for superior filtration from 100 to 1 micron for flows up to 1000 GPM. REGISTERED TRADEMARKS: RAIN FOR RENT®, RAIN4RENT®, RFR®, LAKE®. THE IRRIGATION STORE®, POWERPRIME®, LIQUID INGENUITY®, COMPLETE SOLUTIONS…PROVEN RESULTS®, RITEFLO®, TOOLHAND®, SOLIDGROUND®, PIPESTAX®, RAMPLOX®, HOSETRAX®, EZ KLEEN®, FREEZESENTRY®, LAKETANK®, SOUNDSENTRY®, WORKSAFE®®, E-CONTAIN®, SITEMAX®. ©2019 WESTERN OILFIELDS SUPPLY COMPANY DBA RAIN FOR RENT, ALL RIGHTS RESERVED. We can help with all your liquid handling needs.